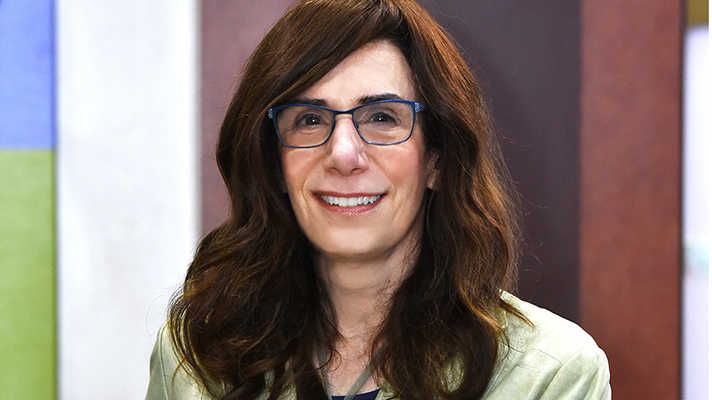 Epic CEO Judy Faulkner has been to many, many HIMSS conferences. So many, she says, that she's lost track. As the company she founded in 1979 turns 40 this year, Faulkner sat down with Healthcare IT News at HIMSS19 for a conversation about interoperability, usability, patient engagement, her own plans for the future and much more. Q. So, a certain cable TV financial guru suggested recently that Apple should buy your company – which he just seemed to think was a no brainer. What did you think of that? A. (Laughs.) Well, first of all I had no idea who he is. I've never watched that show. But secondly, it was like, "This is really weird!" Thirdly, it was just a shrug: "We're not going to do that." And it was just very gratifying that not a single health system contacted us about it and said they were worried. They all said they laughed. Q. Yeah, I suspect they all know how you guys operate. A. So isn't that neat that you knew the answer? We'd just say, "No, that's not going to happen." I think the thing that amazed me most about it is not that he said it. But that the message is so clear around the whole industry that we wouldn't do that. And nobody questioned it. That was a real achievement, I think. Q. As you know there was a big rule that came down yesterday, that's been talked about for a long time and I think it couldn't have been too much of a surprise. Or maybe there were some surprises, from your point of view? I'm sure you haven't read all 724 pages, but any early thoughts on the information blocking proposed rule? What do you expect? A. I don't know. I haven't read the fact sheets. Yesterday was CHIME, now we're here (at Epic Booth 2159) all day. So I don't know. On the one hand, there's certainly a lot of value in it. On the other hand, there are things that have to be figured out. Like timing. What if you're supposed to send your data to a third party; how do you ascertain that they're good player or not? Or do you not? I don't know. So those are things where we have to be learning what the government wants. And if in fact they're not a good player, are we supposed to be responsible for figuring that out? Let me put that differently. If we're supposed to send the data to anyone, but then they're not a good player, are we responsible for that even if we can't check them out? So we need to figure out what's in the rules. I've only heard about it a very high level. The next level down is really the important level. The devil's in the details. Q. One of the points CMS Administrator Seema Verma made today during the keynote discussion was that this rule is largely focused on the payers. Do you think that's a good approach, to kind of help open up that ecosystem? A. I haven't seen the payers be unwilling. The payers, in our experience, have been very willing to share data. Q. What about the notion of consumer-mediated exchange, which was another major theme in Tuesday's keynote: putting the consumer at the center and making them kind of a vector for interoperability? A. Well, we already do that. Do you know Share Everywhere? Do you have MyChart? It's a little thing that says "share my record." We already have the patients control where their record goes. So I'm all for it. I want to give responsibility and information to those patients who want it. So we've already done it. We are believers. But we're also are believers in (the fact that) patients who are different. She may want to have a lot of control of her record. You might say, "I expect the health care provider to take care of it. Don't bother me." So they each need to be able to work. Q. It's been a bit more than a year since Epic launched its One Virtual System Worldwide initiative. What have been some milestones, and what are you looking to help build with that? A. We've already gotten out some of the features. Like images, you can share across systems now and you can click on an image and it will bring over big version of that image and you can see it and you don't have to retake the same image. We now have messaging back and forth between systems, so if I'm a doctor and you're a doctor I can message to your in-basket with secure messaging and we can talk about the patient that I just referred to you. Pretty neat stuff. There's a bunch of other things too, but those are some of the things that I think are going to be pretty useful to customers. Q. Another big topic of discussion today was FHIR and open APIs. How do you see those continuing to evolve? A. I'm going to skip on that one, because I don't know the answer to that. Q. You don't want to gaze into your crystal ball? A. No, not on that one. I'm not trying to be avoiding it. I just don't think I'd give a reasonable answer. Q. Understood. Well, here's another question. What about the cloud? Not too many years ago, many in healthcare were deeply skeptical of the cloud. But now there seems to be an acceptance and comfort level here that did not exist before. How do you see the future there? A. If you consider cloud the same as remote hosting, we're finding many of the health systems want someone else doing remote hosting. It could be for space. It could be for experience, the employees who run it. It could be because they don't feel that they're proficient in it. There's many different reasons. Could be because they feel it could be less expensive if someone else does it. So they might go to a third-party vendor who's done hosting for years. They might come to us. Right now they're not going to the major cloud vendors such as Google, Amazon and Microsoft. Because they're not yet – because as far as I understand it, the large amount of data that they would have to run their databases isn't how those three organizations have organized their technology, so they would have to change some things in order to be able to handle that. And I know that we do have at least one customer, probably two, trying to work with them for disaster recovery. And there are hurdles to get there. They've got to figure out those hurdles. Q. Speaking of some sticking points: We're hearing an awful lot these days about physician burnout and frustration. You know it's no secret that many doctors just don't like their EHRs. What are you doing to kind of help ameliorate some of that? What kind of design choices are you making? What kind of focus groups are you doing with your customers to ensure that the clinicians have an optimal experience with their systems to the extent that they can, and that they can find that joy in medicine we hear so much about? A. Here's something I wish the press would do. And that is, the latest studies I've seen are showing that there's not a high correlation between happiness with the EHR and happiness with their job and the problem of burnout. I think it would really help if the media understands that, and helps everyone else know it. KLAS did a study I thought was very interesting. There's been like five papers in the past year that said it's not really the electronic health record. KLAS asked physicians two questions, among others. One was, how much you like your job? One was, how much you like the electronic health record? And what they found was that there are a lot of people who were satisfied with their job, and who liked the electronic health record. And a lot of people who were satisfied with their job but didn't like the EHR. A lot of people who weren't satisfied with their job but did like (the EHR). And by far the smallest number was those who didn't like both. And from that, they concluded that there isn't a whole lot of correlation. There's a little bit, but not a whole lot. A. I think those are two different things. Do they have merit in saying, “Make it easier, make it faster?” You're right, some of it is going to be government-related, and some of it's going to be that we can keep designing it differently. So, yes, the need to constantly be working on how to make it as wonderful as possible for physicians is there. And we keep working on that all the time. We send our programmers out to customer sites all over the U.S. to try to watch so that if you're developing say the OR system, you go out and watch ORs. You might faint – that's actually happened – but you watch the OR to see, how can our software do better? How do we make it better? How do we get feedback from them? Those are called immersion trips, and all of our programmers do that. There was something else that I want to add to that and that is what KLAS studied, surveying tens of thousands of physicians. And they found three things were very important for liking the electronic health record. And I think there's a fourth, that I want to add, and that fourth is that they have our latest versions. If they're on a 2015 version and we've spent the past four years making the versions more and more helpful to physicians – first getting everything out for meaningful use and then really working on ease of use – and if they haven't installed the latest versions, then that's something they really can do to improve. Number one. That wasn't something that KLAS found. That's mine. But KLAS found that there are three things that really relate to physician happiness. Number one is personalization. That has the highest correlation. If you personalize the system to match your workflow, you are significantly happier than if you don't. So how do we get our health systems to do that? That's a challenge for us. We've been telling them all, go out and do that. So it's really important. Do you get what I mean? Q. What are some of the challenges involved in that? A. The biggest challenge is getting a physician in the room and helping the physicians see that these are the places you can customize, and let's go through it with you and help you do it. It's easy. Number one is personalization. Number two is quality of training. Was your initial training good? Or, as one group said, "horrendous"? We train the trainers, and then they go train the end users. One of the things maybe we should do is have our own folks train the end users and hire a bunch of people to do that. Maybe there are better ways we can come up with for training end users. But if they had poor training that's not good. One of the things we've found really helps is if specialist train specialists: dermatologists train other dermatologists, urologists train urologists, etc. That helps a lot. And then, the third thing on the KLAS list has nothing to do with the software itself. It is, are you an agile health system? They said one of the key questions was: If a physician wants a change made and talks to an IT person, how many committees does it have to go through? And if the answer is zero, that's good. So those are three factors from KLAS, and one from me, that affect that. Separate out physician burnout from happiness, and then we're OK.
Q. I was going to ask. But clearly a lot. A. Right. Ever since it was much smaller. Q. Well, let me ask: Has the health industry evolved in the way that you thought it would? Are we about where you thought we would be in 2019? Or did you even think that far ahead back then? A. I didn't think that far ahead. Q. OK, but to my original point, this has been 10 HIMSS conferences for me, and we've been talking about interoperability at every one of them. We've been talking about it for a long time and still talk about it every year. A. It's getting less, though. Q. Obviously, just by the sheer size of your client base, you have a lot of that kind of figured out among your clients. But how do you see interoperability continuing to evolve on a larger scale? There's Care Everywhere, there's CommonWell and Carequality and the HIEs that still exist. Do you think it's all eventually going to cohere into something whole, and be the ecosystem that people want and expect? A. Well, we are creating an ecosystem. And as we go out to customers who are beyond the normal walls of the clinic and hospital, such as dentists. Such as life insurance companies. Post-acute care and many other areas – although post-acute care feels a little more normal. Life insurance doesn't. Payers don't. But we're going out to them as well. We're going out to specialty labs and specialty pharmacies, and groups like that. That creates that ecosystem of people involved with health, not just healthcare. And then as we move to working together above that, it helps tie them all in. At least for our customers, it's going to be the ecosystem of everyone together. So I see that. It's a really interesting question you ask. Because if you look back at the history of healthcare IT, I think at first the healthcare systems built their own systems. Because they had to. And then, people who worked on those spun off and made their own companies: Here's an OR company, here's an ICU company, etc. And then the healthcare systems bought best-of-breed: "We're going to buy this one and this one and this one, and we're going to make them work together." And they didn't work together. And then, groups like HBOC said, "Instead of you guys buying the best-of-breed, we'll buy it and we'll put them together, and then we can sell you a system with modules that talk to each other. And that didn't work too well. And so then we came along and said, "Put the patient at the center. All the data around the patient." And that's, I think, the essence of one of the main reasons why we've been successful. So if your question is really, at the end of it, will we be able to take thousand points of light and put them together and everything will work well? I think we're going to go back to the beginning of healthcare, people will try it, and it won't work well together, is my belief. Because you put in all these systems, and this group uses yellow to mean one thing and this one uses yellow to mean another, and this uses squares at the bottom and this uses triangles at the top. Are they all going to sit together and say, "We're going to have one user interface so nobody gets mixed up when they go from one to another," and then it makes a bad decision for the patient because they got mixed up? Or are they going to use same terminology? What's going to happen? APIs to share data is only one level. So I think they're going to get into best-of-breed again. Now, that isn't everywhere. I still think that there's going to be lots of places where those systems are going to be incorporated into the basic system and going to do a lot of valuable stuff. It could be education: You've got a patient with a certain problem and here's some really good education material. It could be a calculation that's going to figure out precisely where the cancer is and what to do with it. I think those things would be very valuable. But if they're trying to do what has been done before with best-of-breed, that type of use won't be there. Does that make sense to you? A. Does it sound reasonable? Q. I think probably you'd find some people who would disagree with you there on the show floor, but yeah. A. Well, that's been history. Q. This is Epic's 40th anniversary. How does it feel for you to kind of be that elder statesman in health IT? You've seen a lot of change in this industry – especially in the past decade. A. We've been very busy. But the industry is changing right now. Neal is gone from Cerner. Jonathan is gone from athena. The same folks aren't at Allscripts. It's changed. Harvey Wilson, he was with Eclipsys – that used to be one of the biggies. So, yeah. It's changing. Meditech is still there. Neil Pappalardo, I think is retired, but their CEO has been around for a long time, so that's consistency there. A. Yep. I'll do it for as long as I can contribute to it. And if I can't, then you gotta get me out of there. (Laughs.) But assuming that I can, I'll stay around. Warren Buffett, how old is he now? I think he's 88. And he's a good one to keep watching, because he just keeps chugging along. He just seems like an elder statesman in his industry. And his partner, Charlie (Munger) must be 93 (ed. note: he is 95), and he says at his organization you retire at the age of 103.